Whatever the case, this number seems more in line with the economic data from February and March, but in those months the monthly employment data from the government was not as strong as expectations. This month, expectations had been lowered the past 48 hours as the ISM non manufacturing and weekly claims this week showed weakness, so we have a case of 'better than expected'. The labor force participation rate remained stuck at 64.2%, hence the increase in the unemployment rate to 9% from 8.8% is interesting. Usually you'd expect in recovery for more people to flood back into the job market seeking work, which is why the unemployment rate rising would not necessarily be a bad thing. However that was not the case in April. A more typical 66-67% labor force participation rate would add a few % to the unemployment rate. U16 - the broader measure of unemployment including those marginally attached, jumped back 0.2% to 15.9% from 15.7%. Hourly wages rose 0.1%. Average workweek was flat at 34.3 hours. The market seems to be grabbing strictly on the +244K total (and +268K private sector) and is content with the figures, despite some underlying weakness in the supporting data. p.s. I am unclear if the much heralded 50,000 McDonald's hires would hit in April's data or May's. 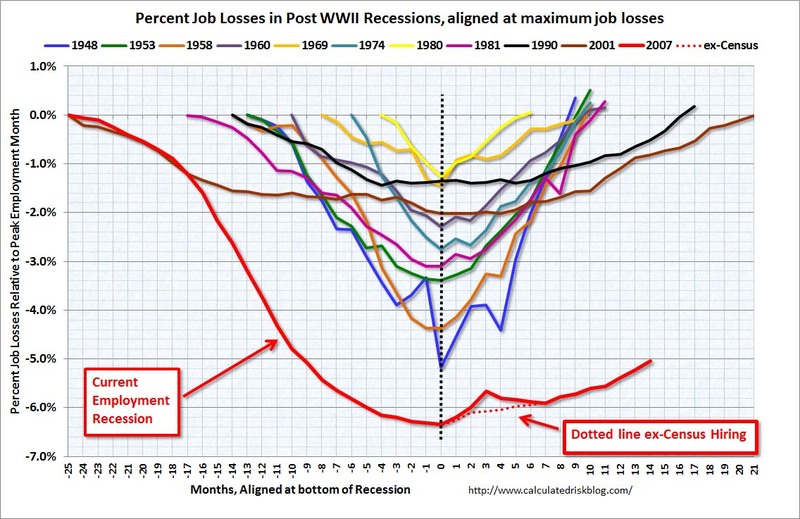 Here is everyone's favorite chart showing the huge hole we must dig ourselves out of via Calculated Risk blog.